Kick off your visit on the 25th (Sun): don't miss a visit to Marttiinin Wanha Tehdas, then see exotic creatures in open habitats at a safari tour, then see Santa Claus Office, and finally get in on the family fun at Santa Claus Village. 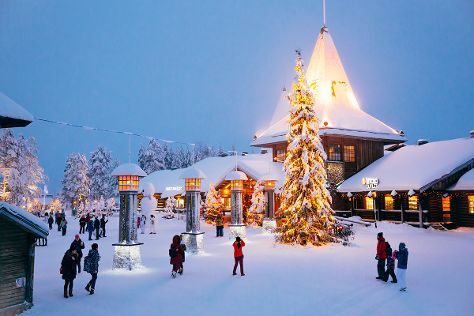 Get ready for a full day of sightseeing on the 26th (Mon): look for gifts at Your Piece Of Finland, then don't miss a visit to Lordi's Square, then get engrossed in the history at Arktikum, and finally find something for the whole family at SantaPark - the Home Cavern of Santa Claus. To see reviews, more things to do, and more tourist information, refer to the Rovaniemi trip builder tool . Singapore, Singapore to Rovaniemi is an approximately 18.5-hour flight. You can also do a combination of flight and train; or do a combination of flight and bus. Due to the time zone difference, you'll gain 6 hours traveling from Singapore to Rovaniemi. Expect colder temperatures when traveling from Singapore in November; daily highs in Rovaniemi reach -2°C and lows reach -7°C. Finish your sightseeing early on the 27th (Tue) so you can travel to Helsinki. Your day-by-day itinerary now includes Porvoo Old Town. There's much more to do: take in the architecture and atmosphere at Rock Church, don't miss a visit to Senate Square, learn about all things military at Sea Fortress Suomenlinna, and get engrossed in the history at Seurasaari Island and Open-Air Museum. For where to stay, maps, more things to do, and other tourist information, go to the Helsinki road trip site . Traveling by flight from Rovaniemi to Helsinki takes 4 hours. Alternatively, you can do a combination of train and flight; or drive. Plan for a bit warmer temperatures traveling from Rovaniemi in November, with highs in Helsinki at 5°C and lows at 0°C. On the 30th (Fri), you'll travel back home.